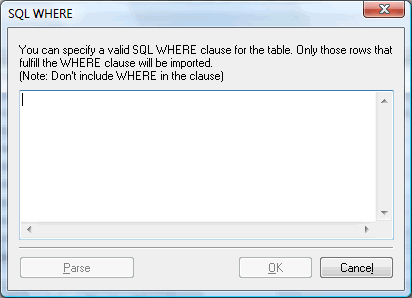 By specifying a WHERE clause in this dialog you tell SQLyog to import only rows that satisfy the criteria set by you. Please note that the WHERE-clause must be syntactically correct on the source DBMS to where it is sent. This may differ from MySQL syntax in some respects. This applies for the syntax used when quoting identifiers and when using operators and functions and all sorts of expressions in the WHERE-clause. Also the word WHERE itself must be omitted as SQLyog will append it at the beginning of the string you specify. Apart from being obviously useful when you need to import only certain rows from your source, SQL Where feature has one more application. 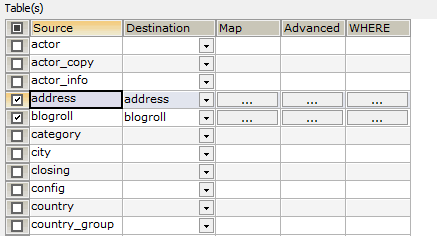 In combination with Triggers on import source, it allows arranging incremental import sessions.